Since this version is new, how do I know these results are accurate? Great question. At the start, we will need some time to properly calibrate our exam so that it aligns with the concordance tables recently released by the College Board and ACT. However, all sections have been designed to mimic the most recent tests released by both companies, down to the correct questions distribution on each section. In other words, the exact numerical values may be slightly off at the beginning, but the results will certainly show a clear difference between the exams if one exists. Will my previous credits be carried over to the current system? Yes. Any credits from previous versions, like 2.4s, will be transferred into the new system and then converted to 3.0 credits once it's officially released. What happens when a new version of a diagnostic gets released? When a new version is released, ALL remaining credits from old exams will be converted to the newest version for free. How can I tell what version my paper booklet is? Diagnostic versions are shown at the top of the bubblesheets, as shown below. Version numbers are also indicated within the front cover, towards the bottom of the page. I still have paper copies of an older diagnostic version (v2.4s or later). Can I still use those? Yes and no. We have designed the system so that you can grade paper copies of the diagnostic by entering the results into an online bubblesheet, or uploading them through a spreadsheet. However, versions older than 2.4s will not be gradable through the new system. Additionally, versions older than 3.0 will not be available to take in the online test environment. Can I still send you bubblesheets of paper exams? For now. We will continue to accept scanned bubblesheets for 6 months after the release of version 3.0. After that, we will no longer accept scanned bubblesheets, and will instead ask you to score those exams yourself through the portal (note that with the new system, diagnostic results can be accessed 24/7 through your consultant portal. Reports are generated minutes after a student completes his/her exam). Can I order a paper booklet of the latest version? Can I get it branded? Is the online report branded? 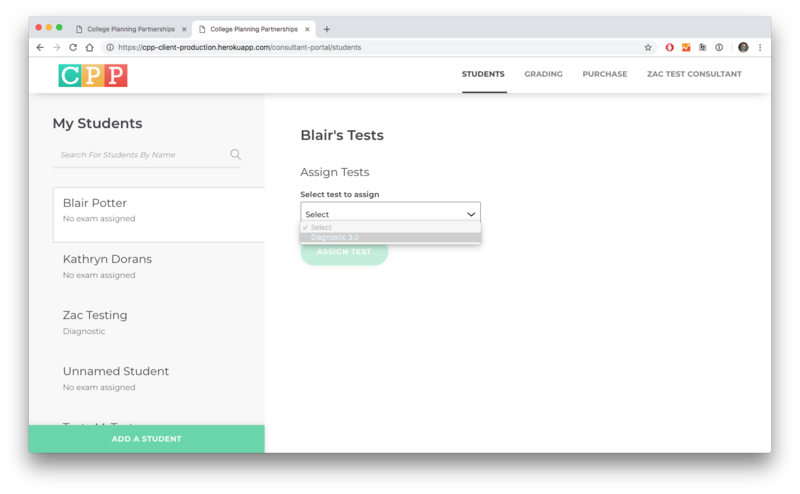 You may continue to purchase (and administer) paper exams once version 3 launches, and you can score them with the online bubblesheet. You can also upload results in bulk, as described here. As long as you upload a logo in your consultant portal, the online report will be branded with that logo. You may also opt to purchase branded diagnostics for a yearly branding fee. For this and other branding options, please call our office. If I buy a paper version of the diagnostic and then you release a newer version, can I still administer the older paper version? Yes. 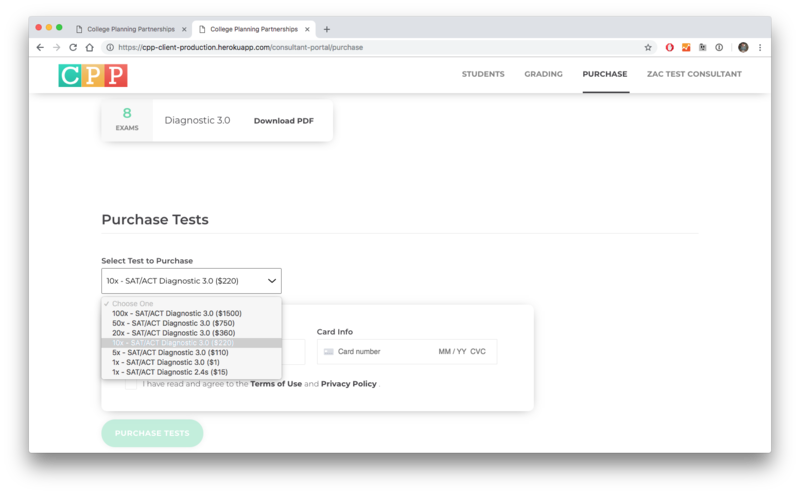 You will always be able to score paper copies of the diagnostic with the corresponding online bubblesheet for that exam, or by entering the results into the test-specific spreadsheet for bulk grading. The report is just a web page. How can I get a PDF of it? Begin by printing the page, then choose "Save as PDF." The report should now page break at the right places. If the pages look off, you may have to alter some of the settings if you've changed them in the past. Once the document is looking the way you'd like, save the file with the student's name. Why doesn't the report have my logo on it? Be default, the system includes our CPP logo. Once you upload a logo through your portal, that new logo will be placed on the report instead. Visit your profile page here to select a file for your "Business Logo." How do I Purchase Exams? Navigate to the "Purchase" tab in the top right. 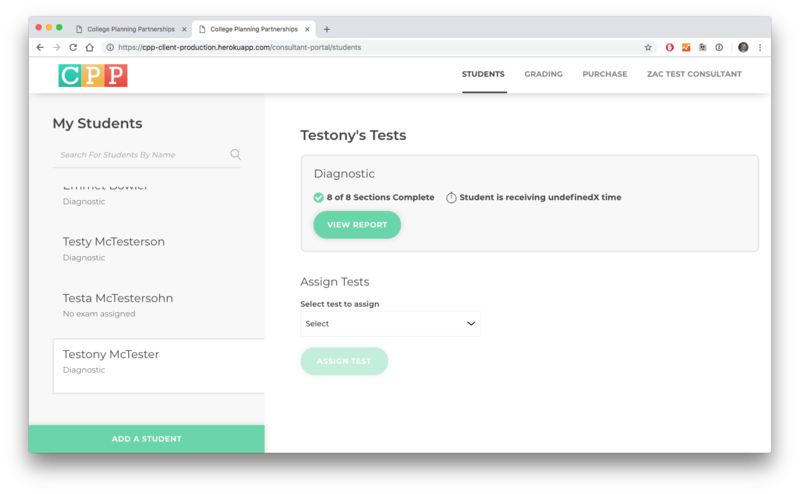 The top of this screen displays your "Available Tests," which is instantly updated once you purchase any exam. 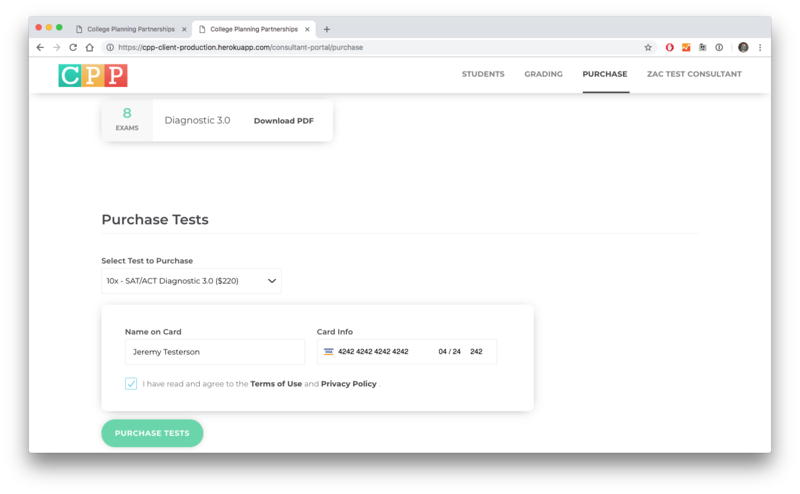 The option to "Purchase Tests" is shown below, along with a drop-down list of the available tests for purchase. Fill out the required information for a credit card purchase, then click the green "Purchase Tests" button below it. How do I assign exams? Select the student you would like to assign a test, then select the type of test (you will only have access to the diagnostic at this time). Click the green “Assign Test” button. 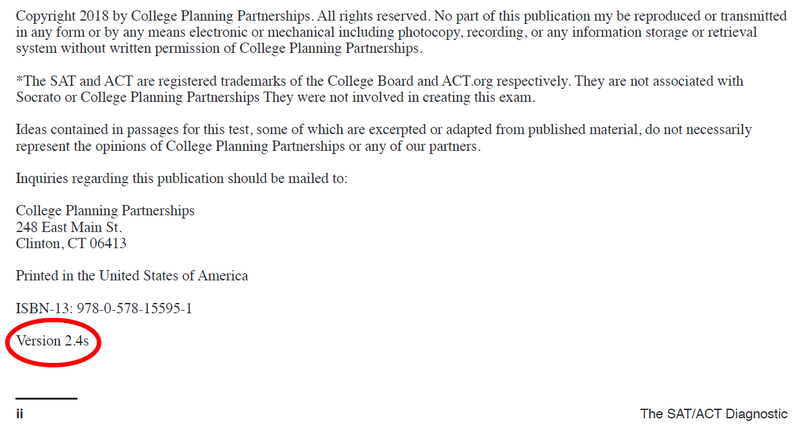 You can now follow the progress of this student on this exam, and these completed sections will be updated in real time. 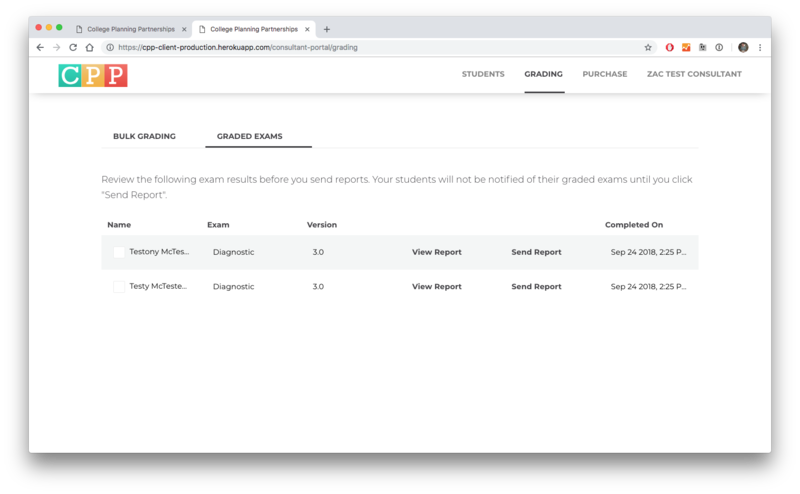 For students that you have graded using the bulk grading feature, navigate to your "Grading" tab in the top right, and then to "Graded Exams." There you can view individual reports (by clicking "View Report"), as well as send multiple reports by clicking the check boxes for the reports you'd like to send. These get sent to the emails that are on file for each student. What changes have been made to the report? Many! The new diagnostic report has been completely redesigned to offer a clean, informative snapshot of the student's performance. For a complete review of the changes and sections, consult the report section of this site here. 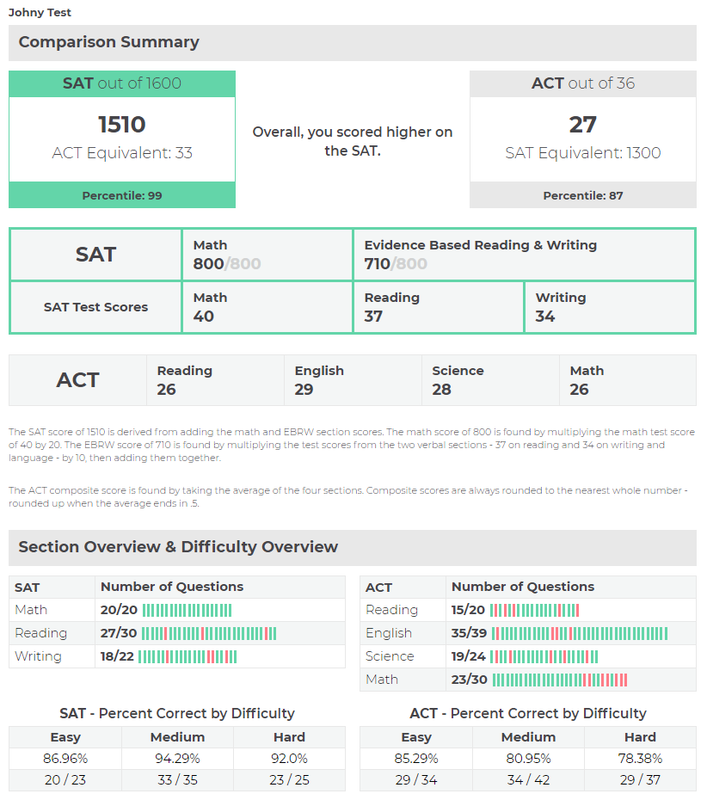 The front page highlights better performance in green, and more clearly conveys how the scores are calculated. Updated explanation text underneath aids further understanding. Consultants and students can now gauge each section's performance through a colored bar chart that shows correct and incorrect answers. The test above, for instance, shows a student might have been running out of time on the ACT Math section, since most of the errors came towards the end. Rounding out the section overview is a breakdown of the performance by difficulty, which provides insight into what questions are being missed. We can infer that this student has greater upside on the SAT because the lowest percentage correct is on easy questions, which means a higher score is easily within reach. Is there a limit to how many exams can be graded at once? There is no limit, but there may be a lag in report generation when working with more than 50 exams at a time. To upload multiple exam results at once, please refer to the bulk grading section here.